Ranked by mining output, Russia is the world’s 3rd largest gold producer with 245 tonnes of mined gold output in 2014. Including gold output from by-products and secondary sources, Russia ranked as the world’s 2nd largest gold producer in 2014 with 288.5 tonnes of output. Either way, gold mining plays a critical role in the Russian economy. It is therefore not surprising that the Russian gold market, and the way it is structured, is heavily influenced by official Russian government policy. In addition to the Central Bank of Russia and the Federal Government, a small number of commercial banks, mostly state-controlled, dominate the Russian gold market. These banks source gold from Russian gold producers (upstream), and distribute, sell and export gold (downstream). Most trading in the Russian gold market involves over-the-counter (OTC) trading by these dominant commercial banks. 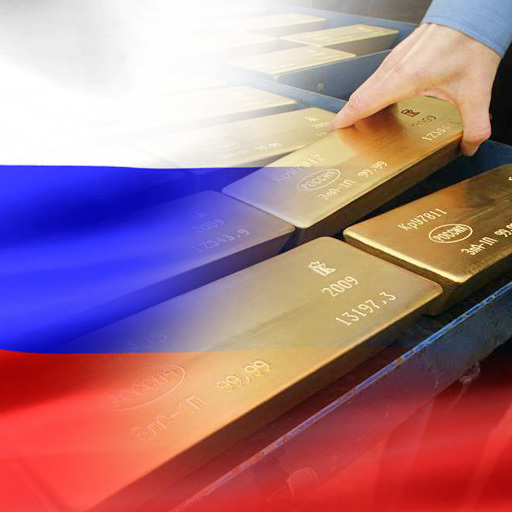 Russia holds the world’s 7th largest official gold reserves (or 6th largest excluding the International Monetary Fund). Over the last decade, the Russian central bank has emerged as a powerhouse in official sector gold reserve accumulation. Russia’s official gold reserves had remained relatively static during the 2000s at approximately 400 tonnes until late 2007 after which an upward trend in gold accumulation by the central bank began. By early 2011, the central bank’s gold reserves had exceeded 800 tonnes, by the end of 2014 had exceeded 1200 tonnes, and by the end of 2015 had breached 1400 tonnes on the upside. Much or all of these central bank gold purchases have been undertaken in the domestic gold market, thereby making the Russian central bank a key participant in the Russian gold sector. On average, the central bank has taken 125 tonnes of gold from Russian gold production each year between 2008-2015. Monthly changes in the international reserves (including gold) can be tracked on the website of the Russian central bank. The Russian central bank stores two-thirds of its gold reserves in Moscow in a building on Ulitsa Pravdy, and one-third in St Petersburg. Another important entity in the Russian gold market is the Federal ‘Gokhran’ which administers the Russian Federation’s State Fund of Precious Metals and Precious Stones. This repository buys, stores, and sells various precious metals and gems, and was established in 1996 by federal legislation. The legislation was amended most recently in 2015 by federal law № 111-FZ. The Gokhran reports to the Russian Ministry of Finance, and technically, has the right of first refusal to buy all precious metals from Russian producers, as long as it provides an element of advance payment to the producer. In practice, the Gokhran has historically not utilised this right extensively, and has left Russian commercial banks as the delegated intermediaries to finance gold producers as well as to buy and distribute the producers’ output, including distributing gold to the Gokhran and the central bank. However, the Gokhran does on occasion purchase and accumulate gold and other precious metals holdings but there is no visibility on its gold holdings, since the Gokhran does not publish any details of its gold holdings, and these gold holdings are separate and distinct from the gold holdings of the central bank. Gokhran transactions in physical gold are VAT free. It is possible though that some of the gold purchases by the Russian central bank come from transfers that the Gokhran makes to the Bank out of its existing gold holdings. In practice, most gold production in the Russian market is sold by gold producers to domestic commercial banks, with the gold producers entering into structured sales agreements with the banks, and the banks providing advance payments and other financing to the gold producers. For example, Polyus Gold, Russia’s largest gold producer, sells its production to Russian commercial banks, both at spot prices and via a price protection programme – which will be touched on later in this article. Physical gold transactions involving producers and banks are VAT free. Gold refiners in Russia, also mostly state controlled, predominantly act in the capacity as service providers and refine the gold mining output from the gold producers on behalf of the commercial banks. The large commercial banks in Russia are also active in trading gold in the inter-bank market, and offer gold holding services (allocated storage and unallocated metals holdings) to their customer bases. To trade in precious metals, Russian commercial banks require a license from the Russian central bank. To export precious metals, Russian commercial banks require a general license from the Ministry of Economic Development. Russian commercial banks have also been granted a number of privileges in the domestic gold market. For example, only licensed commercial banks and the Federal Government can trade in gold with the Central Bank of Russia. Furthermore, industrial users and investors are obliged to purchase gold from commercial banks only. A handful of large commercial banks dominate gold purchases in the Russian gold market and their identities can easily be gleaned by examining sales data released by the Union of Russian Gold Producers. These banks, all of which purchase gold under term agreements with the gold producers, include Sberbank, VTB Bank, Bank Otkritie (formerly Nomos Bank), and Gazprombank. For example, in 2010, Russian banks bought 149 tonnes of gold from the Russian gold producers, with Sberbank purchasing 34 tonnes, Nomos Bank buying 28 tonnes and Gazprombank purchasing 20 tonnes. In 2011, Russian banks bought 156 tonnes of gold, with Sberbank buying 38.6 tonnes, Nomos Bank buying 24.5 tonnes, VTB Group purchasing 22 tons of gold, and Gazprombank buying 22 tonnes. In 2012, the same 4 banks were Russia’s top gold buyers, namely Sberbank, Nomos Bank, VTB and Gazprombank, with Sergey Kashuba, chairman of the Union of Russian Gold Producers revealing that the commercial banks act as proxy purchasers for the central bank -“when the central bank buys gold, it’s from those commercial banks“. “For banks, this is good business — they give credits to mineral developers which repay the banks with the gold they mine. The bulk of gold is later bought by the central bank to replenish its gold and hard currency reserves.”. Therefore, according to the Russian Finance Ministry and the chairman of the Union of Gold Producers, the banks are indirectly intermediating between the gold producers and the Russian central bank for the lions share of these gold purchases. In 2015, Russian banks accounted for 201.6 tonnes of gold purchases. Other commercial banks active in the Russian bullion market include MDM Bank, Lanta Bank, Uralsib and Solid Bank. Beyond the four large purchasers in 2013, the following banks also purchased sizeable quantities from the Russian gold mining companies the same year: Lanta Bank 8.6 tonnes, Asian-Pacific Bank 6.7 tonnes, Baikalinvestbank 6.5 tonnes, Promsvyazbank 4.8 tonnes, Uralsib 3 tonnes, FIA-Bank 1.9 tonnes. Sberbank, Bank Otkritie and MDM Bank and are all associates of the London Bullion Market Association (LBMA), while VTB Bank is an Ordinary Member of the LBMA. Standard Bank of South Africa is also licensed to trade precious metals in the Russian market. Note that Russian companies commonly use the company abbreviation OJSC, which means open joint-stock company. The Russian for OJSC is “Открытое акционерное общество”, which is abbreviated as OAO. Another Russian company abbreviation CJSC, means closed joint-stock company, which in Russian is Закрытое акционерное общество, which is abbreviated as ZAO. A third version, PJSC means private joint stock company. Sberbank of Russia, through its corporate and investment banking (CIB) arm Sberbank CIB, is the largest bank active in the Russian gold market. Sberbank is majority owned by the Russian central bank, through a mechanism where it owns 50% of the share capital plus 1 share, guaranteeing it majority control. The Russian central bank is also the only entity owning more than 5% of the Sberbank share capital. Sberbank distributes more than one-third of Russian gold production, and also maintains over 500,000 ‘metals accounts’ (customer unallocated precious holdings accounts). VTB Bank is part of the VTB Group, one of the largest Russian diversified financial groups. VTB Group is majority owned by the Russian Government, which owns 61% of the Group’s voting shares and 85% of the share capital. The VTB name is based on the bank’s earlier name Vneshtorgbank, which means National Bank of Russia. Otkritie Financial Corporation Bank (Otkritie FC Bank) is Russia’s largest private banking group, and is majority owned by Otkritie Holding. Otkritie Holding’s largest shareholder is Russian Oligarch Vadim Belyaev. In 2012, Otkritie acquired Russian investment bank Nomos Bank and by 2014 had consolidated Nomos Bank into the Otkritie group structure. Although Otrkritie had traded precious metals prior to purchasing Nomos, Nomos was the bigger player in precious metals, so the Nomos acquisition has now provided Orkritie with a larger presence in the Russian gold market. For example, in 2013, Nomos Bank purchased 99.6 tonnes of gold and 399 tonnes of silver, with 82% of this gold, or 81.7 tonnes, being purchased from Russian mining companies and financial institutions, and 18% being purchased abroad. Note that Nomos bank was previous a LBMA ‘Associate’, but following its acquisition by Otkritie, the LBMA ‘Associateship’ passed to Bank Otkritie Financial Corporation in 2014. Gazprombank is one of the largest banks in Russia. It too is majority controlled by the Russian Government via a variety of routes including ownership stakes by Gazprom (itself Government controlled), and Vnesheconombank (a Russian State bank. The Russian Federation also owns 100% of the Type A preferred shares of Gazprombank. The large Russian bullion banks provide a full spectrum of services to Russian gold mining companies, including mine financing, metal lending, purchase of producer output (gold) under sales agreements (with advance payment facilities), risk management, hedging, and precious metals storage. The sales agreements between banks and producers can cover an entire mining season. These agreements address standard issues such as prices received for gold production, delivery terms and settlement terms. The banks cover the cost of refining and processing the metal. Settlement of producer sales would normally be in Rubles. Sales agreements also have to be registered with the Gokhran. This means that the Russian Government will always be fully aware of where Russian gold production is being sold. Entities entitled to export gold from Russia include the central bank, commercial banks, and gold producers. Banks are provided with general export licenses. Other entities require specific export licenses. VTB Bank is particularly active in the gold export market, and it sells gold on behalf of producers and banks on the international markets via loco London settlement and settlement in foreign currencies. VTB has on occasion exported and sold gold on behalf of the Gokhran. In fact, until 1997, VTB had a monopoly in exporting gold on behalf of the Russian Government. “VTB has become the first Russian bank to start direct exports of precious metals to clients in India, delivering its first batches of gold and silver bullion to clients. India is the world’s largest importer of precious metals. In October 2015, VTB also became a member of the Shanghai Gold Exchange with the right to trade on the Shanghai International Gold Exchange. In December 2015, Otkritie FC Bank became a certified participant of the Shanghai Gold Exchange International (SGEI) and plans to sell about 5 tonnes of gold through the SGEI in 2016. The large Russian bullion banks trade physical gold and other precious metals with each other on the domestic and international inter-bank market on a spot, forward and swap basis. The large banks also trade gold with licensed smaller banks. Inter-bank physical gold transactions are VAT free. The large Russian bullion banks are also active in selling physical gold to industrial and jewellery companies in the domestic market. Examples of commercial banks offering depersonalised metal accounts are VTB, MDM, Lanta, Gazprombank and Sberbank. Moscow Exchange hosts both spot trading and futures trading in gold. Moscow Exchange was created in 2011 via the merger of the Russian Trading System (RTS) and the Moscow Interbank Currency Exchange (MICEX). The RTS had been established in 1995 as Russia’s main stock market, and primarily traded equities. MICEX was established in 1992 for currency trading and had grown to also host derivative products and equities. The RTS-MICEX merger was completed in December 2011. Moscow Exchange is now a publicly traded company (full name Moscow Exchange MICEX-RTS PJSC), and its shares have traded on the Moscow Exchange under the ticker MOEX since February 2013. Spot trading in gold (and silver) was launched in October 2013 and takes place on the Exchange’s FX and Precious Metals platform. Trades are cleared through the National Clearing Centre (NCC), which acts as the clearing house’s central clearing counterparty (CCC). NCC is a member of the European Association of Central Counterparty Clearing Houses (EACH) and the Global Association of Central Counterparties (CCP12). Spot gold is quoted in RUB per gram and trades are settled in RUB. The contract lot size is 10 grams. The contract’s trading symbol is GLD (not to be confused with the GLD trading symbol of the SPDR Gold Trust). Spot gold trading is undertaken in special unallocated precious metals accounts known as Type “O” accounts which are opened with the NCC. These accounts are also used for trade settlement and for posting precious metal as collateral by the trading members. Metal balances can be transferred between these Type O accounts and standard ‘Loro’ unallocated accounts. ‘Loro’ is the naming convention in the Russian gold market for client unallocated accounts that are maintained at banks and brokerages. Physical gold deposits and withdrawals can be made in and out of these accounts (dematerialise and re-materialise), and loro accounts also facilitate swaps, and transfers to and from the type ‘O’ accounts. A list of trading members of the Precious Metals Market can be viewed on the Moscow Exchange website. Market and trade data for Moscow Exchange gold spot trading can be viewed on the ‘Quote‘ section of the MICEX website. Then select ‘Precious Metal’ and ‘Gold’ from the drop-down menus. The clearing rules of the National Clearing Centre are available on the NCC website. Cash-settled gold futures quoted in US Dollars per troy ounce are also listed on the Moscow Exchange’s derivatives markets platform. Settlement price is based on the afternoon LBMA Gold Price benchmark. Contract specifications for the gold futures are available on the Exchange’s website. Russian gold refineries tend to call Good Delivery bars ‘standard bars’. These are acceptable for inter-bank transactions. Russian gold refineries usually call their smaller gold bars ‘measured bars’. As an example, Krastsvetmet is Russia’s largest precious metals refinery. The company is located in Krasnoyarsk, east of Novosibirsk, approximately 4,000kms east of Moscow. Krastsvetmet processes primary precious metals material from mines and from industrial scrap material, and the refinery has an annual refining capacity of approximately 250 tonnes of gold per annum, 1000 tonnes of silver and 270 tonnes of platinum group metals. Krastsvetmet manufactures gold bullion in the form of Good Delivery bars, and a range of smaller bars from 1kg down to 5 grams. For full details of the Russian gold refineries, see “Gold refiners and Bars in the Russian Federation”. For physical gold bar deposits and withdrawals in connection with funding and withdrawing from unallocated ‘loro’ accounts used in the Precious Metals Market of the Moscow Exchange, the National Clearing Centre uses nominated vaults of in Moscow operated by Brinks and TBSS. Brinks and TBSS both list their address at 12 Smolnaya Street in Moscow. Russia’s gold market is one of the more fascinating gold markets. This is so for a number of reasons. The Russians have always understood the importance of gold as a monetary asset. Recall the central role that gold played in the Soviet economy as a foreign exchange earner up until the late 1980s, as well as the mysterious disappearance of the vast majority of Soviet state gold holdings in the early 1990s. This understanding of gold’s importance is not lost on the current Russian administration. The Russian gold market is also big enough to create supply shortages elsewhere, since if most Russian gold is being accumulated domestically, it will affect marginal supply outside Russia. Although tightly state-controlled, Russia still has a very well-developed gold market where commercial entities appear to be able to work well together within the State structure, and a large OTC market operates smoothly in conjunction with exchange traded gold instruments. “The gold and foreign exchange industry, i.e. the gold industry and the gold mining industry, is crucial in our country, a leading industry in Russia. Moreover, developing trends in world markets in currencies and commodities – show that world gold demand has, for a very long period of time, exceeded supply. All this makes this [gold] industry very attractive for the government and for private companies”..
That Putin can have expressed such a view on gold, a view that would be anathema to a contemporary US President, says something about the coming changes in the international monetary system. What exactly it says, time will tell.